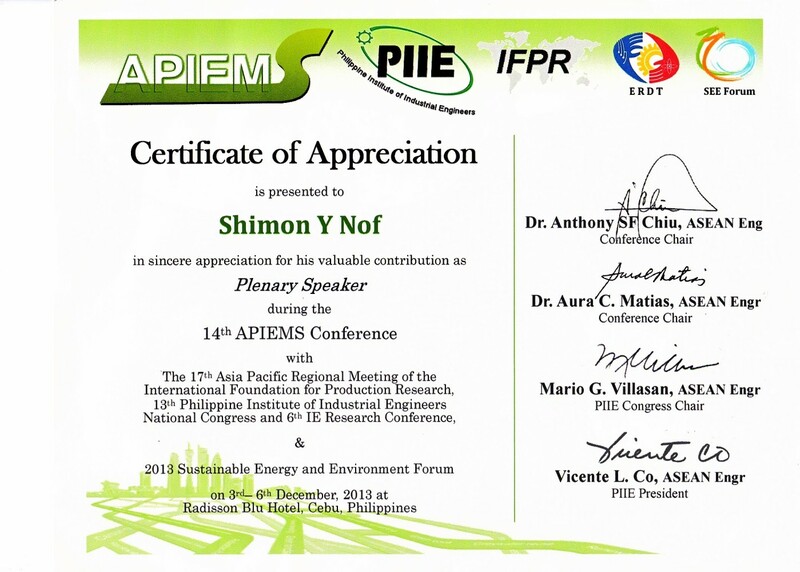 Last December Professor Nof presented the plenary talk on “Sustainability and Resiliency in Supply Networks” at the ICPR-Asia Pacific Region and APIEMS, Asia Pacific Industrial Engineering and Management Society conference at Cebu. The plenary and the conference on this topic were timely and in strong support of the people of the Philippines, after the recent calamities in the Philippines, especially hitting the regions near Cebu. During his visit, Professor Nof also lectured at the University of the Philippines Dillman (Manila), where Professor Aura Matias (Purdue IE PhD) is the Dean of Engineering, and at the University of San Carlos in Cebu City. He was also happy to meet with Many Purdue School of IE alumni from the Asia Pacific Region.